A review of Heather Derr-Smith’s Thrust in Salamander. 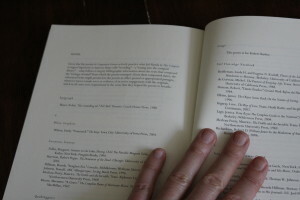 A collaborative review (written with poet friend J.C. Todd) of Ethel Rackin’s Go On up at Jacket2. My review of Sally Bliumis-Dunn’s Echolocation on The Rumpus. A review of Gabriella Klein’s debut collection Land Sparing in Salamander. My review of Annie Lighthart’s Iron String on Lynn Domina’s website. My review of Rose McLarney’s Its Day Being Gone is up here. Kelle Groom kindly asked me to contribute to her post on “What Can Poetry Do?” on the Best American Poetry Blog. Here ’tis.